Apple releases the new Watch Series 4 in the September Launch Event. Now let’s take a deep look into this new model with fully redesign. Apple releases the new iPhones and new Apple Series 4 in the September Launch Event. Although there is not too much surprise in the iPhones, the new Apple Watch really impressed us. Now let’s take a deep look into this new model with fully redesign. The two sizes of the Apple Watch Series 4 are 40mm and 44mm. The bigger one is slightly larger than the Series 3 with 42mm size, but the redesigned screen seems much bigger. The new screen is much closer to the edge, and the four corners are more round-shaped than the before. And the Series 4 is subtly thinner than Series 3 as well. On Series 3 the digital crown features a red dot which looks a bit awkward, so it’s really happy to see this dot is replaced by a red ring that matches better with the overall design. All these new changes together make the Series 4 more good looking and portable to wear. The most impressive watch face in Series 4 should be “infograph” which you can customize different in it as you like. However, the screen seems full of different colors and that may not be easily to get used to, but I think the reason why Apple uses different colors is to help people identify each features in a small screen more easily. The rear of the Watch takes metal off and uses ceramic instead, which will improve the transmission of wireless signal. To enhance the experience in phone calls, the microphone has been moved away from the speaker, and the speaker is set to a much louder volume so that you don’t need to keep the Watch close to your ear in order to hear clearly. 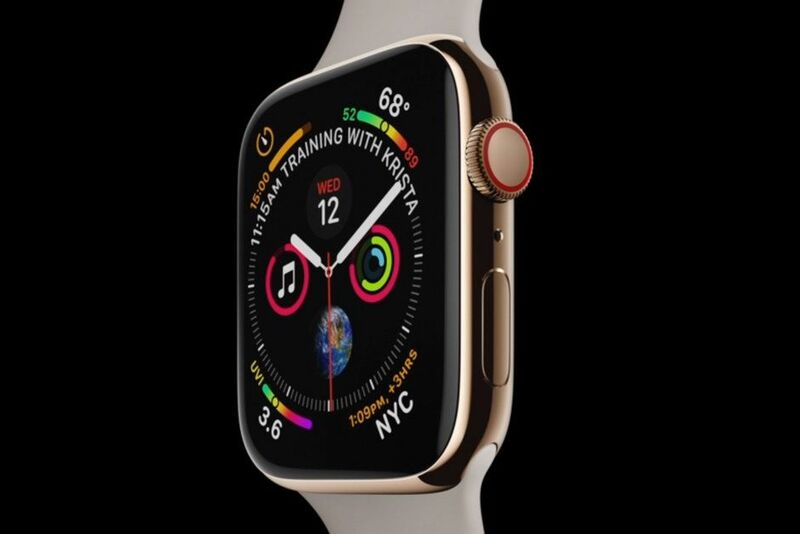 The Series 4 adds new electrical heart sensor and re-engineered digital crown with haptic feedback. The battery life seems better than Series 3. Apple claims 18 hours of regular use or 6 hours of outdoor workouts. The new watchOS 5 has been improved in many ways. You can simply lift your arm and start talking to Siri instead of saying “Hey Siri” to get feedback. And it separates fitness and health features in the new Watch. On fitness feature, it adds new yoga and hiking workouts, and you can compete with your family or your friends in workout competitions. And if you forget to open the app during workout, it will automatically detect the workout data from beginning and continue to record it when you remember to open the app up during the exercise. On health part, the watchOS 5 can detect low heart rate, and enables fall detection. Once it detects you are falling down and have difficulty getting up, it will call emergency services and your emergency contacts after your permission or you haven’t moved for one minute. Apple Watch is always pricy. The least expensive model is the one with GPS and WiFi at $399. And the price adds up with a larger screen, LTE compatibility and different bands, not to say the Hermes model. Although Series 4 is not cheap, it has enhanced in many ways and should be the best Apple Watch ever.